This two hour difference thing is really getting to me. All day long I feel like it is so extremely early, which then transfers to the evenings when I am exhausted well before I should be. I suppose it's a small price to pay in order to spend this time in beautiful San Diego. No, you're right, it isn't much. This is not because it was a quick flight, but because I am a slow knitter (and also using size 0 needles). I have dubbed these my Pebble Beach Socks, because I am hoping to knit on them (it) while here in California, and the name of the colorway just happens to be "Pebble." Fitting, right? Oh, I was so sad because before I even knit one row on the plane, I dropped my needle and it was lost forever. I never did find that thing. Thank god the knitpicks harmony DPN set comes with six needles for each size, otherwise I would have had to... well, I would have had to knit on one of the other several projects I brought with me. You didn't think I would have just brought one lousy sock with me, did you? 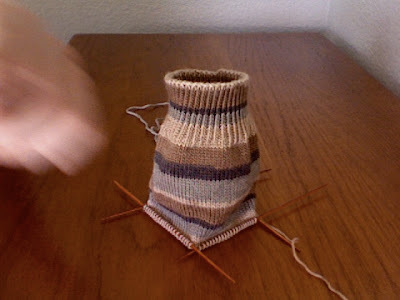 I have been in The Weatherless State now for a few days and have only gotten a few rows done on the sock. I'm not complaining of course because my time has been consumed by other enjoyable experiences such as seeing the ocean for the first time and gazing up at my first mountain. We'll see how much knitting I'll actually get done while on this trip. My friend and I went to the beach today for a picnic in La Jolla and there just happened to be a yarn shop not even a block away from where we parked (I was tipped off by my sister before I left) and I couldn't resist. I didn't buy anything, but it was fun to look around. They do this strange thing where they don't have the prices on any of their yarn, but they have lists placed around the store that have every yarn and the price per skein. I don't quite understand why, but maybe it works for them. I found the shop to be very cramped and somewhat messy looking, but they did have some nice yarn. Tomorrow (later today) my sister and I are going to get together and hit up a bunch of yarn shops around San Diego. It's going to be loads of fun, I haven't seen her in about a year now! San Diego, here we come! Too bad I didn't know you were coming to my neck of the world; I too shop at Two Sisters and Ewe but there are other shops to go to that are fun. Was that another Felici sock? Too bad about the needle, that is the danger of having to use the wood dps on planes instead of circulars which stay put.